Like a growing proportion of the population, I am ‘dealing with’ cancer. But unlike a growing proportion of the population, apparently, I am passionate about books. 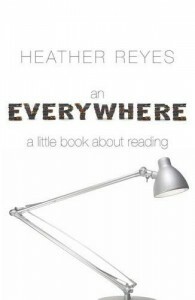 My own recent book, An Everywhere: a little book about reading, brings together the two – illness and reading – between the same covers. The title, An Everywhere, is from a John Donne poem stating that ‘love’ can make ‘one little room an everywhere’. I had a bad time during my first three-month round of chemotherapy and was largely confined to ‘one little room’. But through reading I was able to bring countless worlds into that room: far from feeling confined, I felt on a continuous adventure. I cannot imagine how I would have coped, psychologically, otherwise. Bibliotherapy is nothing new: even Plato recognised the arts could re-harmonize the out-of-tune soul, and it was a common Renaissance notion that poetry and song could rid the body and soul of ‘vexations’. George Eliot alleviated her grief at her partner’s death by reading Dante, and there are countless other examples. I’m told that ‘bibliotherapy’ is something of a buzz-word in the medical world now, some doctors recommending specific self-help books to patients who suffer from mild depression, for example. Reading about and understanding one’s own condition and trying to take control of it has much to recommend it, but there are many medical situations for which this is not possible. If you have cancer, you need drugs, operations, radiotherapy. True, you can give yourself the best chance by studying supportive strategies such as diet, relaxation, appropriate exercise, and so on. But these alone are unlikely to give you total power over your out-of-control cells. For many, it’s the psychological repercussions of serious illness they – and their families – need help with. Going ‘elsewhere’ through reading can be a great help. It also gives you something to talk about with visitors rather than the endless repetition of symptoms and treatment. It doesn’t really matter what one reads, though choosing intelligent, well-written books is more enriching than resorting to the shallow and trivial to ‘pass the time’. I’m a firm believer in trying to turn an unavoidable evil into an opportunity – whenever possible. I love the story of Socrates learning a new melody on the flute while awaiting the hemlock that would administer his death sentence. When puzzled friends asked why he was doing it, he replied, ‘Because at least I will know this melody before I die.’ He chose to enrich life right to the end. One of the most helpful things reading can do in difficult situations – not just illness – is help establish a sense of perspective, of proportion. Some books are better at that than others. I’m not sure Sylvia Plath’s novel The Bell Jar would be a good choice, but Helen Dunmore’s The Siege, set during the Siege of Leningrad, is likely to put one’s own sufferings into perspective. Or maybe a non-fiction book on the origins of life – such as Richard Fortey’s marvellous Life: an unauthorized biography. In An Everywhere, I mention buying the new translation of War and Peace ready for a future hospital stay. I am, indeed, writing this in my hospital room (I’m MRSA positive so can’t be on an open ward), sixteen floors up, with a splendid view over London. The wonderful staff come from every corner of the globe, carrying their stories into my room. But for the times I’m left alone, there’s War and Peace. I haven’t read it for decades. It’s even better than I remember it. I’ll stop now and get back to it for a while. There’s just been a big Napoleonic battle and the suffering of the soldiers in their filthy, crowded field hospital makes me feel very, very lucky.